Birds Park brings you to Pantanal walk-in aviary with colorful exotic birds from coastal wetlands. Pantanal walk-in aviary is the second one along the birds trail in the Parque des Aves. The large construction covers the local rainforest with a kind of ‘artificial swamps” on the ground. Just for the record: Pantanal is the large region of swamps and wetlands along the Paraguay River in northern Brazil. On the west it is slightly extending to Paraguay and Bolivia, on the north it borders equally famous region of Mato Grosso. The area is well known as a wildlife paradise – especially for birds making the best out of this hardly accessible area. No wonder – the Pantenal has the greatest variety of birds species on Earth proving once again that the biggest danger for any ecosystem comes from humans. The Pantanal walk-in aviary in the Parque des Aves creates the ecosystem similar to that in the Brazilian Pantanal. Colorful toucans occupy the canopy, but the ground level is visibly the place reserved for Scarlet Ibis (Guara), spoon-bills (Colhereiro), few species of herons, ducks, seriema and other species. But Paranal Aviary is not only about Scarlet Ibises. You will find here for example Rufescent Tiger-Heron (Soco-boi or Avetigre Colorada),Roseate Spoonbill (Colhereiro or Espatula Rosada) and a beautiful Southern Screamer (Tacha or Chaja Comun) with black belt around the neck. Abundant wildlife in the Paranal wetlands of the aviary. Most left picture: Southern Screamers, most right one shows the Red-Winged Tinamou (Perdiz or Tinamu Avirrojo). The Scarlet (Red) Ibis inhabits the coastal tropical wetlands and mangroves in the northern South America (Venezuela, Guyana, French Guyana and Brazil). 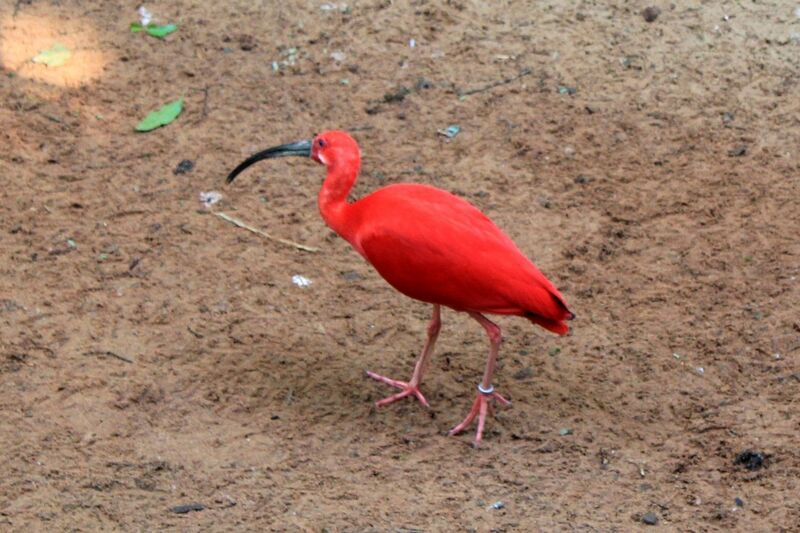 Scarlet Ibis also lives on islands of Trinidad and Tobago where it is considered as a national bird. The bright-red plumage with black tips on their wings and long curved bill are the two most visible characteristics of scarlet ibises. They have long legs but this feature is typical for all waders. With a length of about 60 cm (23 inches) and weight of about 650 grams (1.4lb) they are relatively small (definitely much smaller than flamingos). Genetically, the Scarlet Ibis is closely related to herons, spoonbills and storks. Juvenile Scarlet Ibises are actually grey-brownish with white underbelly. The radiant red colors come later in life from the pigments of crustaceans on which they feed (similarly as flamingos). Their diet consists of red crabs (hence the colors), but also includes shrimp, mollusks, frogs, small reptiles and insects. The red color of plumage intensifies with age although it may change if the red-pigments reach food is not readily available (it mainly happens in Zoos). The long and curved bill is used as a probing tool when searching for food in shallow muddy waters. The bill is highly sensitive recognizing a potential food by touch. Scarlet Ibises live in large colonies in close proximity to each other. Male and female usually pair off for life. Together they will construct the nest and later care for young. They fly in characteristic and admired by us V-shaped formations. Scarlet Ibis is not on the list of endangered species. However like many other wild species it is facing the constant pressure from humans – starting from habitat destruction to over-hunting or eggs collection. 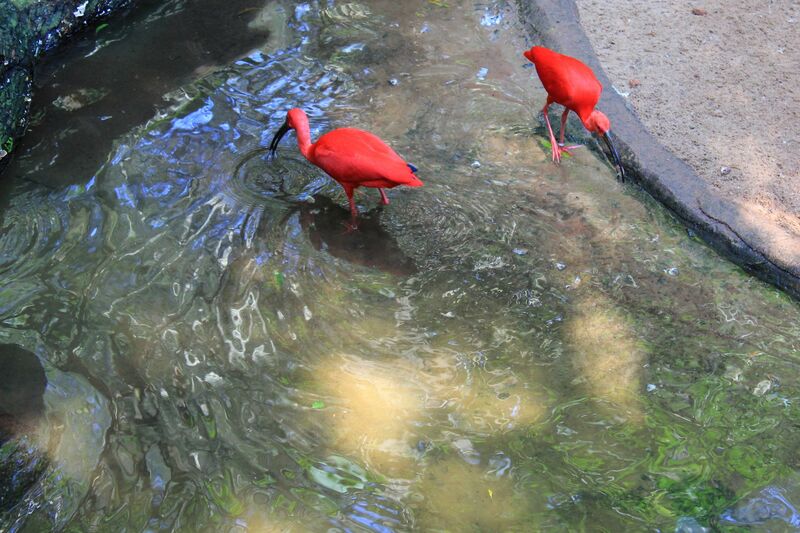 I hope that you enjoyed pictures of Scarlet Ibises and facts about their lives from the Free Birds Park Pictures. So now it is time to move farther exploring more aviaries and wild-life enclaves in the Parque das Aves. Going out of the aviary there are few smaller cages with different parrots and then once again a big walk-in aviary with macaws. So first let's see the beautiful Golden Conures! They are also known as Golden Parakeets (Ararajuba or Aratinga Guaruba). Red-tailed Amazons (Papagaio da Cara-Roxa) - a beautiful Brazilian bird threatened by extinction. Golden Conures enjoy spending time in treetops, where they also reproduce in large holes and hollows. The small populations of these species are living in the Amazon basin, but they are threatened by extinction due to the destruction and fragmentation of their habitat on one hand and bird trafficking on the other. Traffickers often mutilate and forcibly remove the feathers of adults to make them resemble chicks. The colony of Golden Conures in Parque das Aves was rescued form terrible conditions in the wild by IBAMA (in Portuguese – the Brazilian Institute of Environment and Renewable Natural Resources). Happily these birds are recovering well and are even reproducing in their new home of Parque des Aves. Red-tailed Amazonas are Brazilian species threatened with extinction due to the destruction of their natural coastal habitat and illegal trapping. This specie lives at the coastal regions of the Parana and Sao Paulo States. There are about 4000 birds left in the wild. With the cooperation of the conservation authority Foz Tropicana Bird Park has initiated a captive breeding program to help save this specie.